Annie has been busy selling Community Days coupon books and just finished the spring sale. She’s a trooper being there most of the time. The animal communicator said she’s chill when she gets there because she thinks we’re going on an adventure, and we’re at Boston Store again. She does perk up for different people, but it isn’t consistent whether it’s kids or adults. The vet found a mammary tumor at Annie’s annual checkup. She had it removed a week ago, and she’s healing nicely. The vet had the tumor tested, and it is cancerous. She believes she removed it all, but we need to monitor Annie’s lymph nodes for bumps. She’ll be taking a much deserved break from appearances while she is on the mend. Annie is such a sweetheart, and her vet admitted Annie is her favorite patient. She has so much love to give and enjoys receiving it too. She’ll sit in the doorway and won’t let you through until you give her a pat. She also will put her paws on the side of the bed and scratches my back to wake me up so she can receive even more attention. We hope she’ll be with us a long time, so we can go on more adventures besides Boston Store. I am very, very happy to report that after 9 months in foster care and a lot of work, Chloe was adopted last week. She is now able to go to the vet without being afraid or growling--no muzzle needed. She can also get bathed. She goes swimming at a local doggie swim place. Last September she had a neurological event of some sort; (seizure??) after a neuro consult/evaluation, we were looking at a slew of possibilities, including cancer. We took a 'wait and see' approach and she has been doing great. She is a happy girl who is officially home. She is much-loved and spoiled by her new dog mom. This is a happy, happy ending! Nala loves to stalk the squirrels in the yard. She will also say hello to any neighbor or dog that comes over. Nala enjoys playing with Payton and snuggling with him on the sofa. Nala will run and play so much during the day that all of a sudden she will curl up and go to sleep, the next thing you know she is snoring. Such a joy to have in our family! The Little Princess continues to blossom and grow every day. Lately she's been stepping out of her comfort zone and even asks to go along on rides. Over the weekend we stopped at a small local pet store to pick up a bag of food, and while there were all sorts of smells of other dogs that seemed a little scary, the smell of yummy treats and good food won out. (That and we were only there for about five minutes!) Bella seems to really enjoy making people friends. She squeaks and seeks attention from anyone one who is willing to offer it (very much like my last Golden -- I would swear he'd let a burglar in to the house and show them the valuables as long as he'd get a pat on the head!) Other four-legged friends are sort of hit-and-miss, so we approach those friendships very cautiously. It seems that as long as she meets a new dog on "their" turf she is more apt to not be stinky about it. If, however, you are coming in to HER castle, she will pout (yes, pout!) if another dog is getting her attention. Bella is very observant and while Miley the day-care-dog is not her favorite friend, she seems to have watched the joy that Miley finds in life and she has started exhibiting some of Miley's silly, happy behavior (only when Miley is not around ) Meaning, she has started running around the yard and teasing with you. She "dances" for her dinner every night and is becoming more and more animated with me during our little ritual, which always end by sitting like a lady before her dinner is presented to her. She definitely knows her name and is learning some simple commands. "Sit" is a gold star task. "Come" is getting there, especially if a whistle is used. "Stay" -- well, we still have work to do, okay? The leash still isn't a favorite, but pink is indeed a Princess's color and as long as it doesn't stay on long, is tolerable. On nice days, outside is a good place to be and there are favorite garden spots to check if Bella isn't immediately sited. She loves to explore the fenced in yard and was even observed giving a bunny a chase just the other day! Almost no more crawling... only on rare occasions when she is intimidated for some reason, or scared... but fewer and fewer observations of that behavior. It is truly a blessing to watch this little girl grow in confidence. She is very happy and content most of the time. The only time she fusses seems to be if there is a time she can't go along on a ride and needs to stay home. We have had no bathroom accidents, no behavior accidents, only a snappy incident with Miley -- never at any other time or with any other animal (still watching that though -- work to do in socialization -- but slowly but surely coming along). Bella is a joy, and it is indeed an honor to be entrusted with her care. To tell the truth -- it's not just Bella who is blossoming . Noah has been with his new family for about 2 weeks now and seemed to know he was where he belonged right off the bat! He is getting lots of love and enjoying life in the country where he runs and plays with his canine sister Abbey, and two cats that he lets crawl on him. He gets to go for hikes, car rides, and boat rides too! In the evenings he enjoys cuddling with family on the couch and everyone is head over heels in love with this boy. Another success story that warms the hearts of our volunteers! Nala has found her forever home! Watch for an update on how she is settling in very soon. Garbanzo (Gabby) has been adopted! Riley was adopted by her new forever home today! Great family whom she will love and be loved by! So happy for all of them! Aikman was adopted by his new forever home today! So excited for him and his new family! I wanted to share a wonderful success story with GRRoW volunteers and supporters. When Tango was 5.5 years old, he joined our family. It's hard to believe that 8.5 years have gone by since I adopted this happy, sweet, loving Golden named Tango. He is still named Tango, still loves playing fetch, going for walks and swimming, although at a much slower pace. On August 5th, 2016 we celebrated his 14th birthday!! He looked so happy and proud wearing a tie, eating his dog-safe carrot birthday cake, and enjoying a swim with his "sisters" Daisy and Emmy. Tango is a gentleman to the core. He is loyal, protective, and very loving to all he meets. Through the years, we've added to our adopted family two canine "sisters" and his feline "brother" and "sister." Tango has welcomed all of them with love and grace. I know you probably hear this all the time, but he is a perfect Golden. We feel blessed to have him in our family and we are very grateful to GRRoW for placing us together. Thanks for the wonderful years we've had with Tango. We look forward to enjoying our time together! I've attached a couple of pictures of our handsome fella during his birthday party. 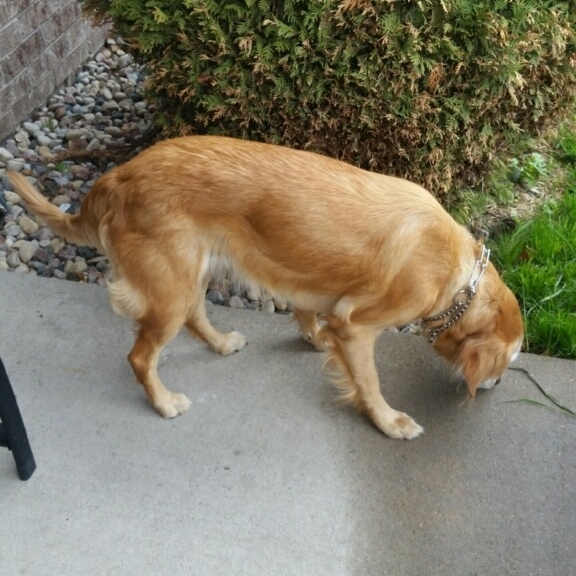 Elsa is a Golden Retriever / Irish Setter mix. She has been moved to an Irish Setter rescue who is able to work with her on her setter-like characteristics. Gracie was an outside dog all her life and had a rough start but really adapted well to our home. 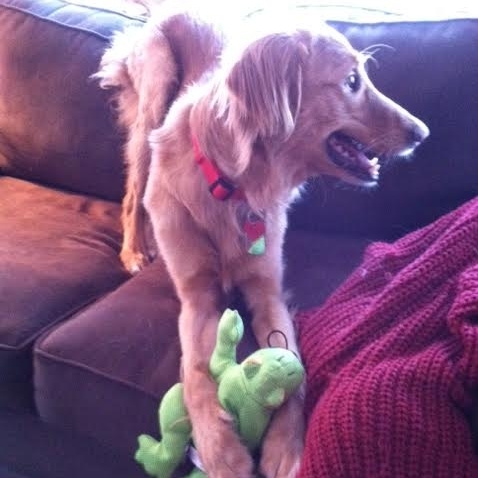 We attribute much of her success to her BFF, our male golden, Jack. She has found comfort in new toys that are new to her, a bed that can be shared and furniture to climb on and relax. Her anxiety about storms and being left alone are calming with the help of Jack and some meds. She ignores our cat and has decided that the kennel is not to be feared. We can’t believe with all that she has been through she has adjusted to our family so well and so quickly. We know she was intended just for our family and we are always amazed with what each day will bring. Simba has been adopted! Keep an eye out for updates him.